Rosekind: Things started to change Thursday with Takata. WASHINGTON (Reuters) -- Takata Corp., under pressure from a $14,000 daily fine from U.S. regulators, has started to become more cooperative about documents involving a deadly defect in its airbag inflators, the top U.S. auto safety regulator said on Friday. "They're starting to become forthcoming," National Highway Traffic Safety Administration Administrator Mark Rosekind told an audience of consumer advocates. "My understanding is that yesterday, things started changing around." he added, without elaborating. NHTSA slapped the $14,000-per-day fine on Takata last month for failing to cooperate fully with its probe of airbag inflators that have been linked to at least six deaths and dozens of injuries. The devices, which can explode and spray metal shards into passenger compartments, have resulted in 17 million vehicle recalls in the United States alone. The government accused Takata of dumping more than 2.4 million pages of documents on the NHTSA without any guide to or explanation of the content. Despite new signs of cooperation, Rosekind said it would take several meetings between NHTSA and Takata representatives to change the situation significantly. "I'm not sure they're far enough yet," he said at a meeting of the Consumer Federation of America. 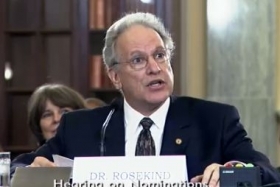 Roseking, a former member of the National Transportation Safety Board, took NHTSA's helm in December amid expectations that he would make the auto regulator more responsive to defect issues following its slow response to recent problem with Takata and General Motors ignition switches. He pointed to the Takata case as an example of NHTSA's "willingness to stand up and fight on behalf of the consumer" and said the Obama administration will seek new authority from Congress to impose stiffer civil and criminal penalties. "We are taking any actions allowed under the law to hold manufacturers accountable. But it's clear to any unbiased observer that the law does not currently provide our agency with sufficient authority to hold bad actors fully accountable," said Rosekind. Rosekind also said he would address longstanding consumer complaints that NHTSA is too close to industry to be effective, a problem for which critics blame a "revolving door" of personnel between the agency and the private sector. "I'm not going to support anything except our neutrality and independence and protecting the consumers," he said. "I can't control who leaves, but I'll control who comes in and I'm at the top making the decisions."